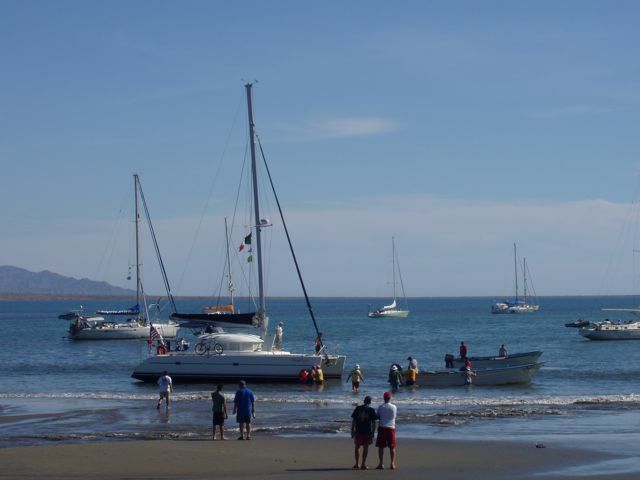 After three nights offshore, we arrived at Bahia de Tortugas. I imagine that at one time there were sea turtles here, but naturally they were overharvested and now there are none. 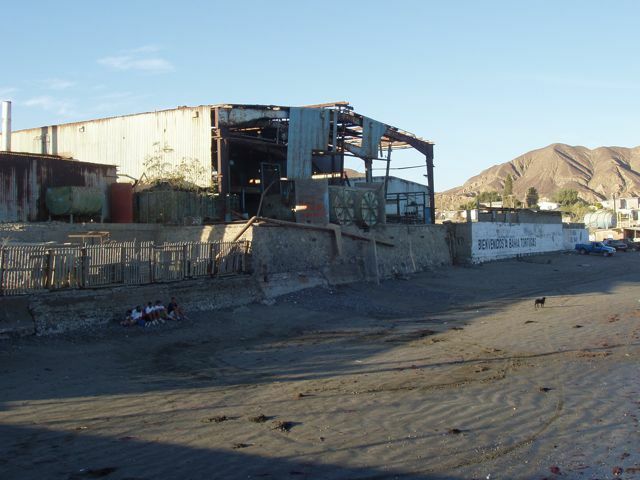 Bahia de Tortugas is a small dusty Mexican town with dirt roads and happy people. 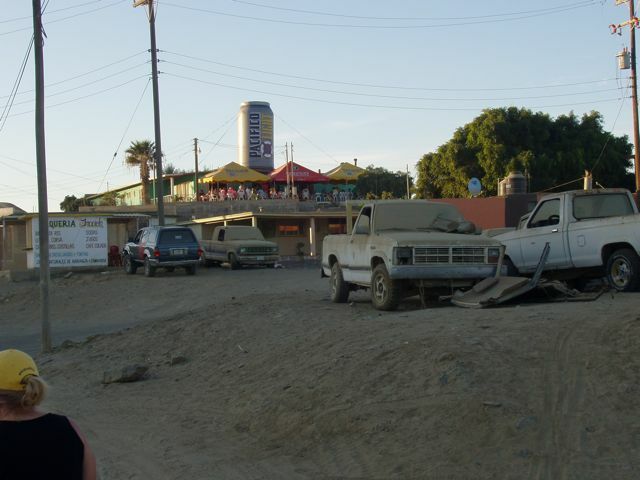 The town is on the main Baja highway, so has the services of a larger town: small infirmary, restaurants, and some commerce. We learned that 30% of the year's entire economy was fixed by the Haha fleet's arrival. The infrastructure is crumbling but life is vibrant and it's a safe coastal fishing town. 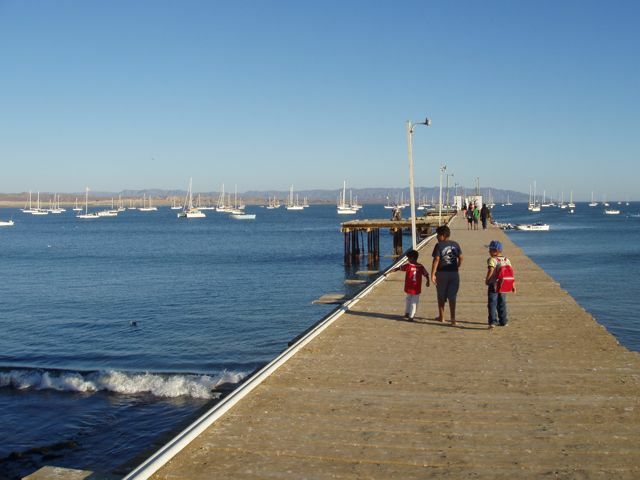 The town wharf, complete with gaping holes from missing boards, was the landing point for pangas, the local fiberglass boats, used for everything from fishing to transportation. They're powered by large outboards. Local kids hide from Sun behind a wall facing the beach and Haha fleet. The dilapidated factory once housed a turtle processing facility. The turtle population was not able to meet demand and is now gone. 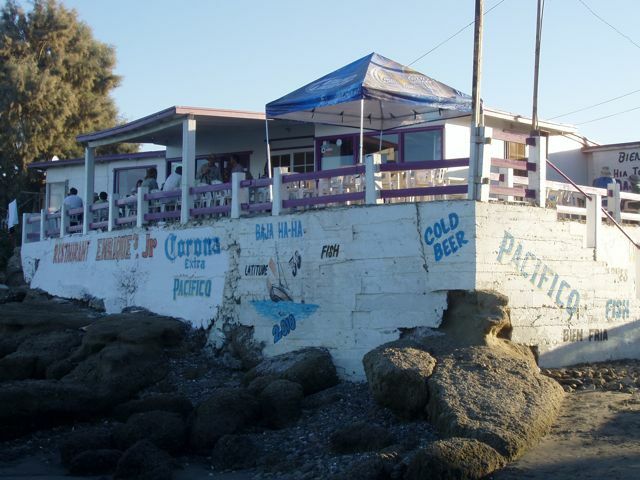 Enrique's Restaurant on the beach hosted a lot of cruisers. Restaurant Vera Cruz with its Pacifico can. Conni is at left, wearing her Haha hat. The entire town resides under a thick coating of dust since all roads are dirt and it infrequently rains. 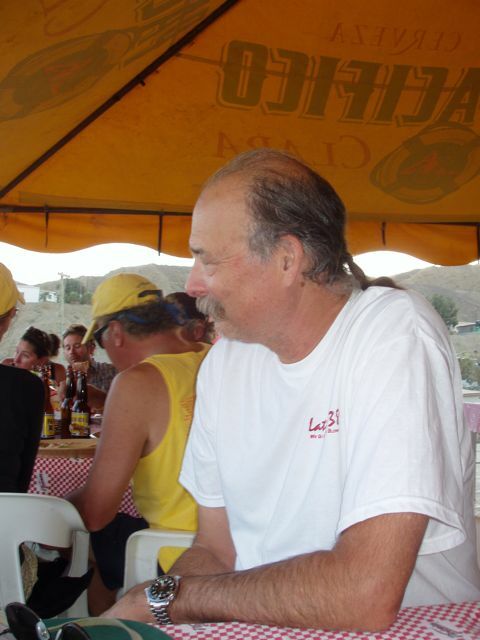 Bill awaits his first Pacifico. 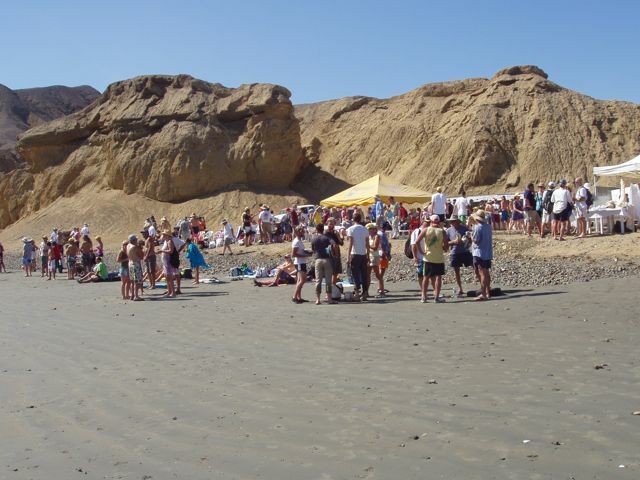 El Primero Fiesta del Playa: the first beach party. The dry, lunar Baja landscape is an interesting backdrop to the fiesta. This was a potluck with participants providing the food. Conni strolls with a "7&7" hiding in her soda bottle. Happy Conni! 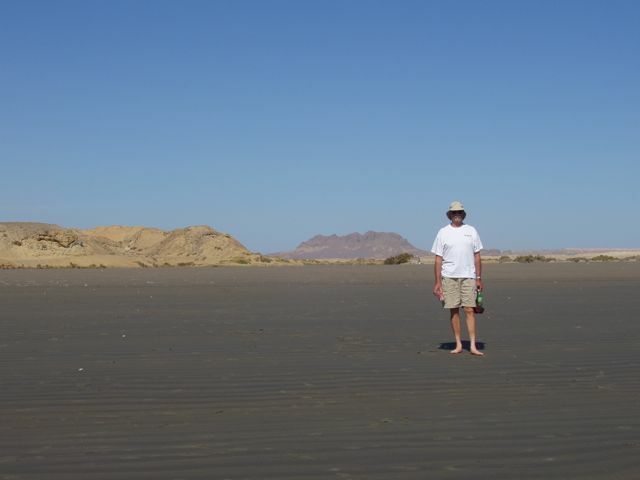 Shades of grey surround Bill in front of the dry Baja landscape. The afternoon entertainment is provided by Younger Girl. Although specifically warned by the Grand Poobah (his official title) not to anchor so close to shore, her skipper now finds his craft hard aground. She has "saildrives", the foot of an outboard engine protruding downward from the aft end of each ama. Oops! 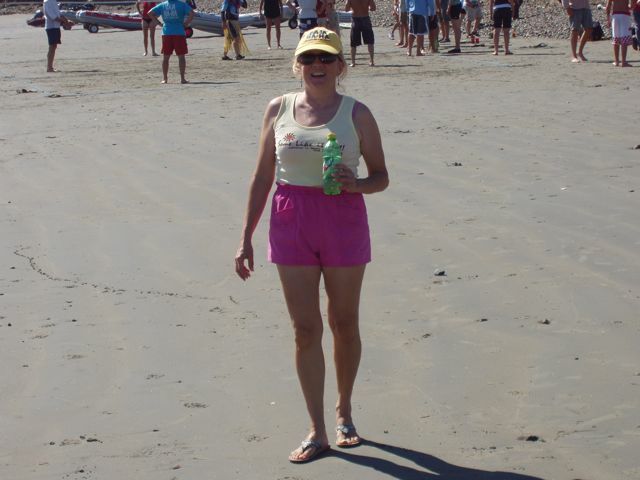 The pangas are attempting, in vain, to pull her off the beach. Later that evening, the returning high tide re-floated her with no damage. 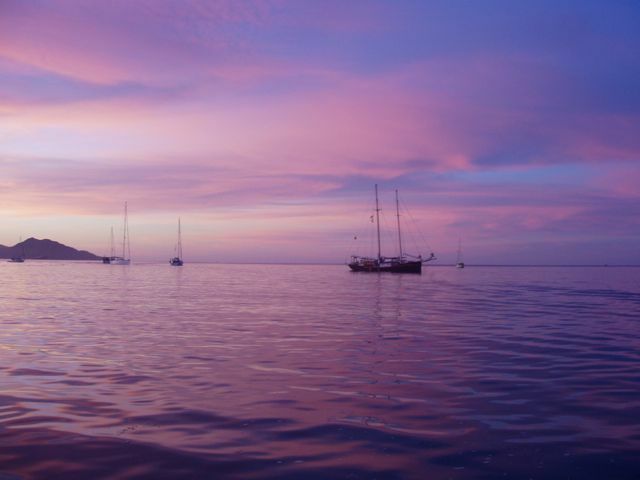 Sunset in Bahia de Tortugas.